Add beauty and strength to every part of your home when you shop with us at Flaherty’s Flooring America. Our selection of natural stone tile in Houston, TX, is designed to create a standout style both indoors and outdoors. At our flooring showroom, we proudly carry a complete collection of natural stone floor tiles for clients throughout the area. Whether you are looking for marble, slate, or another option, you are sure to find something you love when you visit us. Shop with our team today to discover more on this top material. Bathrooms, kitchens, and other parts of the home will pop with a fresh set of stone tile. This top material offers a range of different applications, making it a popular choice for any homeowner. From using it to create a natural stone tile shower to installing it as your backslash, your choices are unlimited when you turn to us. Due to its strength and durability, natural stone tile can be used both indoors and outdoors. Stone stays cool on your floors and patio, even during the warmest weather. When added to these areas, stone can create a seamless flow throughout the home. Customers with children, pets, or other sources of heavy foot traffic in their homes should choose a durable flooring material to hold up to use. The natural strength of stone makes it a top option for every type of residence. This material is both scratch and abrasion resistant, and it will maintain its stunning look for a lifetime without the need for extensive care. Choosing to replace the flooring in your home can do more than add a fresh style to the space. 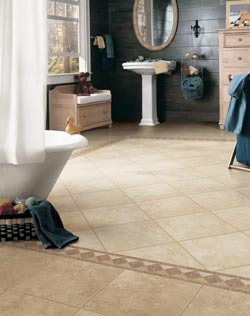 Adding natural stone floor tiles to a home can increase its value over time. Speak with us to learn more about how this material can help you make the right investment in your property. Ensure that every tile is placed in the right position when you turn to our professionals for your natural stone tile installation. At our flooring store, we proudly provide service options for spaces of all sizes. We work quickly and efficiently to deliver a quality result to every job. Speak with us to take on each of your service needs. Contact us at (281) 297-8144 to discuss the benefits of stone tile flooring. Our showroom features products and services for customers throughout the Northwest Houston area.